With the recent news that Cave Story is indeed headed to the DSiWare service this fall, screenshots of the game in action have already become hotly anticipated. Luckily, we were able to get our hands on three shots of the game in action for you to enjoy. We'll keep you posted on any new information on the DSiWare version of Cave Story and we'll have a full review of the game shortly after its release later this year. You can read on for the official statement from Nicalis on the subject. Heck yeah, I downloaded the Freeware version and it was really buggy. Ill get this portable for sure as I just didnt want to pay the asking price on WiiWare. Ill pay for it portable though. Man the DSiWare service is heating up big time! I can't WAIT to get my hands on this one. Loved the WiiWare game and now I can take it with me wherever I go! "And the game is actually DONE, we're currently in final testing internally"
And they waited until now to announce it!? I've already beaten the WiiWare version, but I'll gladly pick this up to support Pixel, Nicalis, and my portable Cave Story needs! So, who is this Pixel guy anyways? "And they waited until now to announce it!?" I wish more people waited until games were done (or just about done) to announce them. Remember how many "Where the heck is Cave Story?" posts and threads we had about the WiiWare version? That's true, I suppose it makes more sense for a game that caused that much of an uproar to be announced so close to completion, but I still think hype is a good thing (for the most part) in gaming, just not for this game in particular. Once again, Best. News. Day. Evah. This + Shantae = epic plus more epic times epic to the power of epic. And right after the DSiWare let us down again! Whee! Must buy for me on day one! First time playin this game so it should be fun for me. Wow, this will be awesome! And I paid 1200 pts for WW version. I´m sure DSi´s costs like 800 pts. So it's been confirmed?! Awesome! I can't wait! Unlike CS for Wiiware, I have no legit reason not to get it! Considering how awesome the PC game is, I'm looking forward to this one. But I think I'd like new features, like the WiiWare version, because the original was free, and as great as the game is, I'd like more justification. They still need to fix the sound and bugs in the Wiiware version. Are they ever going to patch it? I heard Europe is getting a fixed version. Wouldn't be fair to not include americans. Can I actually have my Wii version first? Pleaaaaaaaaaaaase!?!?! Yeah, WHERE THE HECK IS THE PAL VERSION OF CAVE STORY??? I agree with ^ . PAL WiiWare please sirs! I didn't realise there was confirmination about this. Wow! Although I'm not getting too excited over "done." Remember the last time a very similar game also named Cave Story released for a Nintendo download service was said to be "done"? Where's the EU version? Ah, screw this, I'm done waiting for you, I'm going to play it anyway. So... it's releasing on WiiWare and DSiWare in Europe around the same time? Or will we have to wait for the DSi version? Because frankly, I'd rather play that. OH YES! I wonder how much it'll cost. Well... I already have it on WiiWare so I'm not interested in the DSiWare version. Shantae AND Cave Story? Finally, DSiWare is picking up again. I'm annoyed that the wiiware version isn't out in eu yet but even though it means waiting longer, I think I'll get this version because of it being portable. First Shantae release date and now Cave Story for DSiWare !, great news . Same here. I also want to see all the bugs (well, at least the game-breaking ones, I know there's no way to get rid of them all) fixed from the WW version before plunking down my cash on a previously free game. So, will they re-release the Wiiware version over here to correct the music? And the map on the bottom screen on DS is just great since it will make the game even more fast paced. Sweet, hopefully it'll be cheaper than the WiiWare release. @Slapshot: What do you mean, bugs in the freeware version? I've almost played through the entire freeware game (not including the sanctuary, I'm on the final boss) and I haven't found any bugs. Maybe the version you got was broken for some reason. Oh, and YES! Can't wait to see it in the shop channel! It's going to be AWESOME! Now I know what to do with the points left over from getting Shantae: Risky's Revenge! Thanks, Nicalis! This is DSiWare's biigest season yet. If I had a dsi i'd pick this up. I'd love to support pixel and the possible other games he'll port to the consoles, and having a portable cave story is the best possible option to play the game! Can't wait! Saw this in a forum earlier! this one better get it released in europe! [email protected]: No worrys dude, I'll do my part to help ensure it does. So what centuary is this coming out in? I mean Nicalis arn't the best at getting their games out on a release date we haven't got the wii one yet. They seem to be able to make games in a matter of weeks or months but then certainly take their time testing it and then forget about europe. 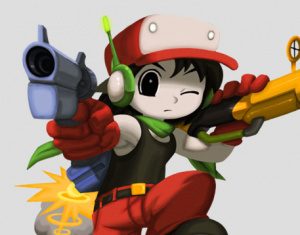 @NapalmHornet: Nicalis just started, and Cave Story was their first or second game. They most likely learned from their mistakes.